The first week of the clay season could not have opened with a more thrilling and nerve-wracking contest! 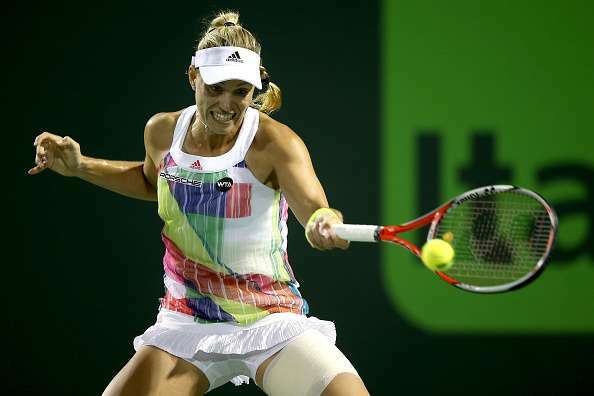 Australian Open champion Angelique Kerber was put to a stern test at one of the oldest WTA clay tournaments – the Volvo Car Open in Charleston – before the 2015 winner could pull off a 6-2, 5-7, 7-6(3) victory over Spain’s claycourt specialist Lara Arruabarrena late on Tuesday. The top-seeded German looked to be cruising initially in this second round clash as she stormed through the opening set, breaking her unseeded opponent twice. But the feisty Spaniard managed to turn the tables on the World No. 2 in the second set to force a decider. Once again, it was the higher-ranked player who had the early advantage and swerved for the match at 5-3. But Arruabarrena did not want to surrender so quickly and stretched the set to a tie-break, where Kerber eventually won. The German finished with a barrage of 49 winners against 44 unforced errors in her first claycourt match of the season. The resurgent Eugenie Bouchard too emerged victorious on Tuesday as she prevailed 6-3, 6-4 over Alexandra Dulgheru, breaking the Romanian four times in the first round. Joining the Canadian in the second round was another spirited youngster – the 14th seeded Daria Kasatkina. The Russian, who has made rapid strides of late, dropped just three games to blitz past China’s Saisai Zheng, 6-2, 6-1. This was the 18-year-old’s 100th career win. 10th seed and former champion Samantha Stosur had a 6-4, 6-4 win over qualifier Aleksandra Krunic in a contest that witnessed as many as 10 breaks of serve in two sets. American Bethanie Mattek-Sands, who won the Miami doubles title last week, carved out a 5-7, 6-3, 6-2 win over Brazil’s Teliana Perreira. Earlier in the day, Croatian veteran Mirjana Lucic-Baroni and 11th seeded Frenchwoman Kristina Mladenovic played a marathon second round match that involved an epic third set tie-break. It was Lucic-Baroni, who eventually came through, 4-6, 6-4, 7-6(13), saving as many as four match points.